The Government has stalled the Child Care Package by tying it to other welfare reforms in the Omnibus Bill. 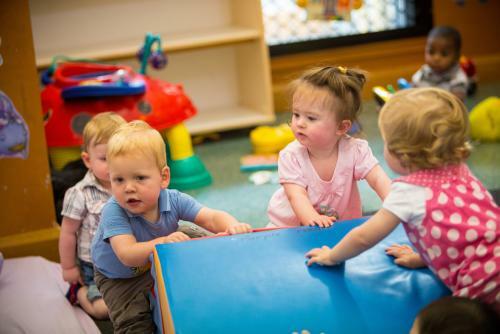 Samantha Page, CEO of Early Childhood Australia (ECA), calls on all Federal politicians to stop using the Child Care Subsidy Reform as a pawn in political gamesmanship. The latest results of international tests like TIMSS and PISA showed either no change in math and science scores for Australian students while other countries improved, or even displayed a decreased performance of Australian students. Samantha Page, CEO of Early Childhood Australia (ECA), explains why improved access to quality early learning is essential to turn this around. Two reports released this week provide valuable information to assess the Government’s proposed Jobs for Families Childcare Package. Samantha Page, CEO of Early Childhood Australia, calls on the Federal Government to amend the Package Bill to ensure that all three and four year olds in Australia will be able to access early childhood education. The Federal Government has proposed changes to the funding of childcare. Samatha Page, CEO of Early Childhood Australia (ECA), responds to comments made by the Education Minister Birmingham and says that if the Package and Activity Test remains as proposed many thousands of families will opt out of the system and the children who stand to benefit the most will miss out. The Federal Government has released a new childcare package on the weekend. Samantha Page, CEO of Early Childhood Australia, welcomes the reform but voices some concerns. The Productivity Commission has released the final report from its Inquiry into Child Care and Early Childhood Learning. Samantha Page, CEO of Early Childhood Australia, says the report is a good start but lacks a clear enough vision for families. Prime Minister Tony Abbott has decided to redirect funds from his controversial paid parental leave scheme into early childhood education. Samantha Page, CEO of Early Childhood Australia, welcomes the policy change. Early Childhood Australia CEO, Samantha Page, examines the current state of early childhood education and care services in Australia and shares her thoughts on what is needed to secure a brighter future. The Gonski review has prompted a national conversation about the importance of education and how best to use funding today so generations of children will benefit. This debate is about values and what we want for our children’s future. It is also about economics. For Australia to thrive in the long term we need citizens who are smart, adaptable and creative. The missing piece in this discussion about education is the importance of early learning.